Golden Alexander Hosts Black Swallowtail Butterflies! Golden Alexander’s (Zizia aurea) umbrella shaped clusters of tiny sunshine yellow flowers have been lighting up my shade garden for weeks, and will continue for a while longer. Like so many plants, Golden Alexander responded to the unusually warm winter and early spring temperatures by blooming a few weeks earlier than normal. When the flowers are pollinated, dry fruit capsules replace them, an attractive feature for many weeks to come. Golden Alexander’s rich green foliage is visible for much of the year. 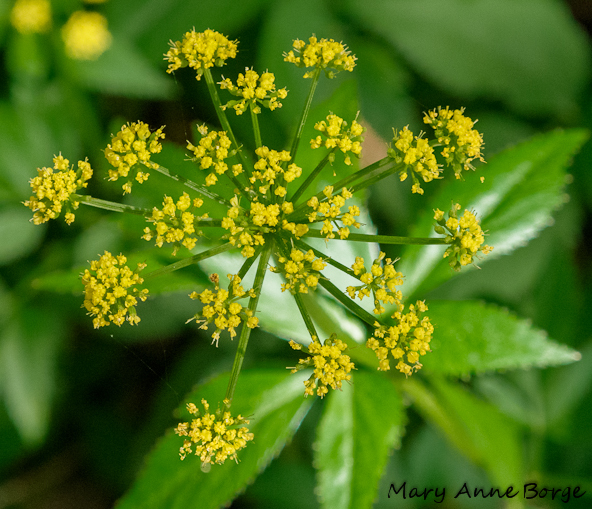 The bright yellow flower umbels help identify Golden Alexander as a member of the parsley or carrot family, and a food plant for the caterpillars of Black Swallowtail butterflies. Other members of this family include parsley and dill, which Black Swallowtail caterpillars will also readily consume. Adult butterflies will visit a variety of flowers for nectar, but their caterpillars can only eat parsley family members, and rues. Members of the parsley family contain natural chemicals that can be toxic, a defense mechanism the plants use to deter their consumption by potential predators, from insects to mammals. But Black Swallowtail caterpillars have a special ability to detoxify the chemical, and eat the plants. The chemical helps protect the caterpillars from being eaten by making them distasteful to predators, such as birds. 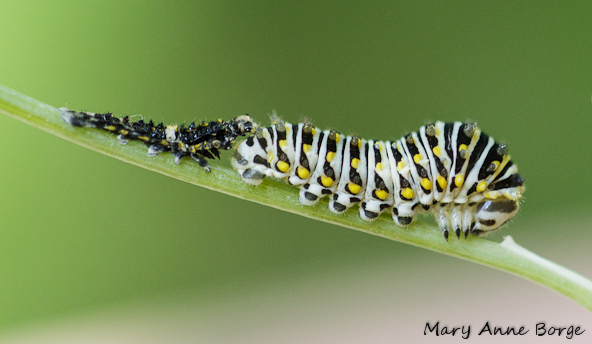 Black Swallowtail caterpillar with shed exoskeleton from its previous instar (growth stage). 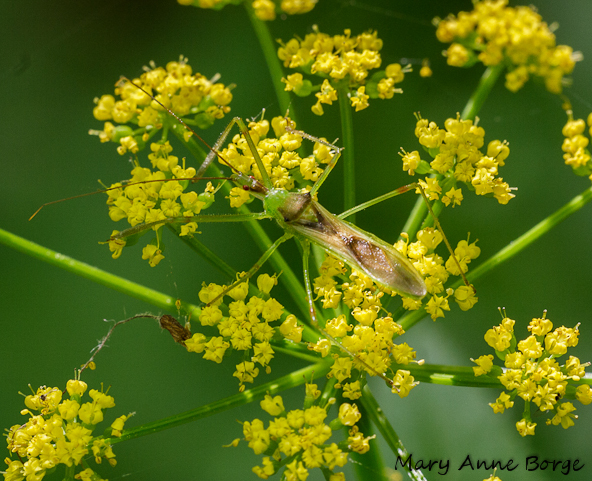 Golden Alexander’s bright flowers entice a variety of beneficial insects to forage for nectar and pollen, and at the same time, assist in pollination. Visitors include a variety of early bees, wasps, flies, beetles, and small butterflies. There is one bee species, Andrena ziziae, named after its preference for this plant. Insect pollination isn’t a given, though. These pollination partners have to evade the clutches of predators who would like to eat them, including spiders, and assassin bugs, like this cleverly disguised Zelus luridus. So Golden Alexander has self-polination as a back-up strategy. Golden Alexander (Zizia aurea), and the similar looking Heart-leaved Alexander (Zizia aptera) reach a height of 1-3 feet. They can tolerate sun to at least part shade, and like somewhat moist soil. I have them in a shaded bed along the edge of a driveway. They have adapted very well, and are very easy to grow. Golden Alexander will spread readily from seed, and in my garden, it is not preferred by deer. Always a good quality! 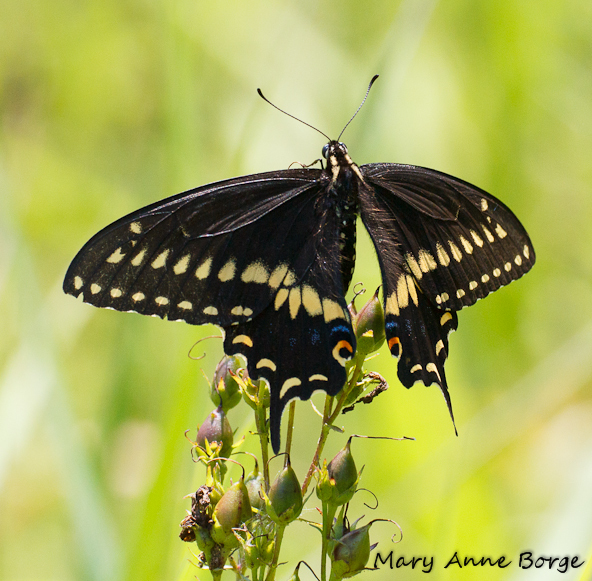 This entry was posted in Butterflies, Gardening for Wildlife, Native Plants, Other Insects and Spiders and tagged assassin bug, Black Swallowtail, Golden Alexander, nature, Zelus luridus, Zizia aurea by Mary Anne Borge. Bookmark the permalink. Wonderful photos of the golden alexander and its attendant fauna! If all else fails, do an internet search for ‘native plant nursery’ and your state, or for the plant, in this case Zizia aurea. It’s safest to use the Latin name when searching for a plant, since there may be different common or English names used for the same plant in different regions, or more than one species of plant may be known by the same common name.